(Bishop) Cardinal Gong Pinmei with pectoral cross - Jesuit group photo. Golden Jubilee of Bro. Xavier Coupe, SJ. Fr. Jin Luxian, SJ, stands to the right of Gong Pinmei. Shanghai (Xujiahui). 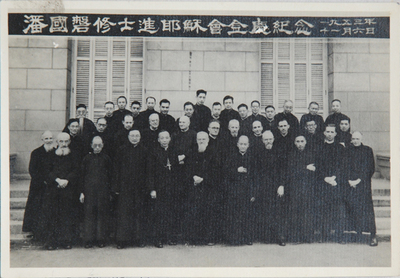 Original Collection: China Province Jesuit Collection. B/W Photo.